With the flu season fast upon us nothing is more important the proper hygiene to ward off all of those germs. In fact did you know that washing your hands properly can help prevent everything from the flu to eye infections! 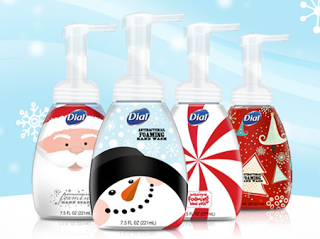 This holiday season my family is staying healthier by washing with Dial Foaming Hand Soap. Although I am still a little torn on the foaming part I love dial products so I thought huh why not :). We found some adorable holiday designs and put one next to every sink. I was quite shocked to see that my kids actually loved to wash more with the foam versus with regular bar soap. The smell was great, the look was great and most importantly we have avoided any serious sickness so far this season. As the flu dies down we will continue to scrub our hands clean with the help of Dial. What is it about the foaming hand soaps that make kids want to wash. I love that they created this my son loves it.